Postcard from Naples 4 - If you have ever travelled in this part of southern Italy, you have probably been here or at least close to it. It's not actually in the gulf of Naples. You have to go to the next gulf down, the gulf of Salerno and, specifically, to the Amalfi coast. That is, in fact, the town of Amalfi in the background below. The clump of white buildings and the "rock" out in the water are unmistakeable. The city of Salerno is a few miles away, past that last hill in the distance. 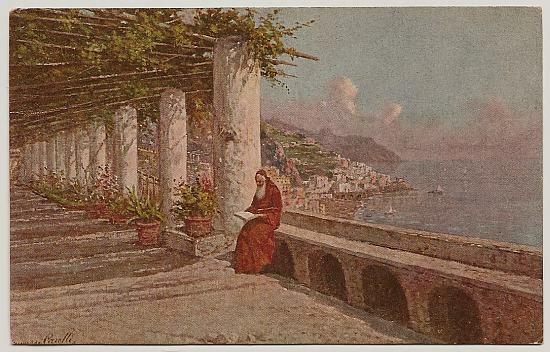 The postcard is reproduced from the original, Scoglio Amalfi con Il Convento dei Cappuccini [The Amalfi Rock with the Convent of the Capuchin Friars]. (Yes, they also make a pretty good cappuccino, especially now that the place is a 5-star hotel! (Fair warning. This is not Motel 6. The rooms start north of 500 euros a night. The cappuccino is included. That coffee/milk combo is called cappuccino, by the way, because in color it resembles that of the habit worn by these followers of St. Francis of Assisi.) p.s. Don't ask for "a latte' because you'll get a glass of milk. How the monastery went from what you see (above) to the hotel you see here (image, left) is perhaps the most interesting part of the whole story and provides some insight into Italian history, specifically the relationship between church and state. The original building goes back to 1212 and went through a few centuries in the hands of the Cistercian order. It passed to the Capuchin friars in 1583, and had a relatively normal existence. (I remind you that the Capuchin friars of the Franciscan order take a vow of poverty. I guess if you're going to be poor, this is a pretty nice place to be it in.) Then came the French Revolution and Napoleon, and things went from poor to worse. All monasteries in nations occupied by the forces of Napoleon were closed (including in Naples in the very early 1800s, under the rule of Murat). The friars left the monastery and were not permitted to return until well after the 1815 restoration of the European monarchies. The friars returned to Amalfi in 1836. They were then evicted again a few years after the unification of Italy (1861) under the extremely anti-clerical government of the new Italy. The town of Amalfi became the new landlords of the property. They turned the whole thing into a Nautical Academy, perhaps hoping to somehow relaunch the ancient glory of Amalfi, one of the four medieval Italian maritime republics (along with Venice, Genoa and Pisa). It served in that capacity from 1866 to 1882 when it became a hotel. Rome fell to the forces of the new Italy in 1870. With that, the 1000-year-old theocracy known as the Papal States came to an end. It was a difficult time for any clerical entity such as a monastery. Most of them just went under, usually becoming something else (hospital, school, hotel, the Naples city hall, etc). The relations between church and state were not settled until the Lateran treaty of 1929. By that time, the Capuchin monastery in the postcard had been a hotel for some years. New owners remodeled everything in 2002 and did a spectacular job. 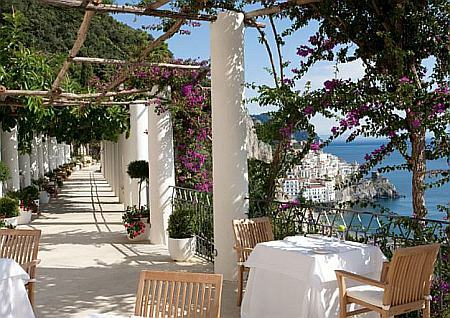 Now it is the Grand Hotel Convento Amalfi. So grab that front table, get a book, put on your habit (the hotel may refer to it as a "bathrobe") get tranquil and smile. Say 'cheese'—or at least 'cappuccino'. Hold it.